I talk to Allyson Reigh from Rosie & the Riveters about writing great songs, presenting positive messages about women and the band's creative inspirations. 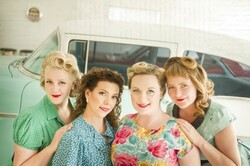 Rosie and the Riveters are a group of four women who make music full of harmony, energy and uplifting messages. The band line up consists of Allyson Reigh, Farideh Olsen, Alexis Normand and Melissa Nygren. Allyson Reigh explains that the band was started by Farideh Olsen because she wanted to create a musical group that was solely focused on women coming together to make music. She continues, "Farideh had been a part of the music scene for a number of years and she was interested in starting a group that was not only serious about music but serious about supporting women. Over the years the line up changed a little bit but we've been in our current configuration since 2013." Rosie and the Riveters are inspired by the strong women who came before them. Allyson says, "We take a lot of inspiration, not only from the women who fought for the right to vote and who were in the workplace when the men were off at war, but also from strong female musicians in the folk world and the gospel tradition." She adds, "When we started to sing together we loved the positive, uplifting message of gospel music but we also started to sound a little bit like the Andrews Sisters in our harmonies. We decided to roll with it and see where it went. We have taken influences from women who have paved the way for us, adding our own musical touches and charm and coming up with something unique." She elaborates, “We are four women coming together as friends, business partners, and band mates. There's this idea that women can't work well together and that's just not true. The message that we're sending is that women can come together and be strong and talented and independent." Allyson says that the song writing process can happen in two general ways for Rosie and the Riveters. She explains, "Sometimes one of us will come to the group with a tune and we'll work on it together and figure out the harmonies. There won't be anything we need to change about the song. Other times we'll each bring pieces of a song in or we've just written a chorus or a verse and we'll work on it together. In that case, it's more of a collaboration." The band's latest album is Good Clean Fun! which was released in 2015. Allyson says, "We had a fantastic time recording it. We worked with talented Winnipeg musicians and we had a great time. Being the the recording studio brings its own challenges but also brings a lot of joy. It was really awesome to have the songs come out at the end, hear how they were interpreted and hear how the musicians added their own talents to them. It was a great experience!" While a male-dominated music industry can be an issue for female musicians, Allyson says that Rosie and the Riveters' experience in the folk music community has been somewhat different. She says, "There is a collective consciousness in folk music, though, because it has a tradition of being anti-establishment and there are many folk artists who are activists, so it makes the folk community more open to new ideas and niche groups so it is a little bit different." The band travels with Farideh's child. This can occasionally be a logistical challenge but Allyson explains that they wouldn't have it any other way, She says, "It's a joy for us and we love it. I can't imagine traveling without her child along. It's really amazing." Another challenge that they occasionally encounter is not being taken seriously as musicians due to their gender. Allyson continues, "It hasn't been our overall experience but we certainly have encountered situations where people might not take us seriously." In Allyson's view the Canadian folk music scene is thriving. She says, "We just attended the CFMA awards in Toronto and to see the community and feel like we're a part of that community was incredible. From an outside perspective, it might be seen as weak or dying but it's actually pretty vibrant and strong. There are many folk clubs across Canada promoting this kind of music and there are many unsung heroes who play a large part in keeping it alive and thriving. Just because it isn't on commercial radio doesn't mean that it isn't alive and well. We've had a lot of radio success with the CBC as well as on regional and underground radio stations." The band is looking forward to their future endeavours. Allyson says, "We've reached a point where we're well placed in the folk industry. We won a Saskatchewan Arts Award this year and we were nominated for the WCMA and CFMA awards. We just want to take it further and higher. We want to put out another great record, continue to tour and build our fan base. For us it is really about connecting with people. There's such a need for that kind of positivity these days. We want to put on am uplifting show that speaks to the need for positive encouragement and for women to come together." The sources of inspiration that Rosie and the Riveters draw upon are many and varied. Speaking for herself, Allyson says, "Sometimes it's listening to a great record put out by one of your friends. For example, I was just listening to Dave Gunning's newest record and I got so much inspiration from it. It just makes you want to write songs that are meaningful to you. When I'm writing music for Rosie and the Riveters, I think about what message I want to send." She adds, "For example, on the last record I wrote a song called Red Dress that was about not being a wallflower and putting on something that makes you stand out and feel good. It's about picking up bits of inspiration along the way and finding your own voice!" For more information on Rosie and the Riveters, visit them here. This profile is based on an interview with Allyson Reigh conducted and recorded on Dec. 5, 2016.